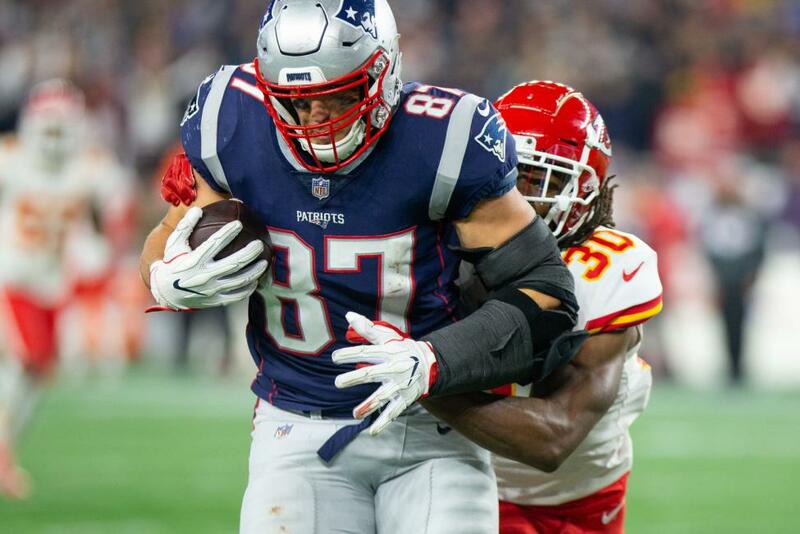 New England Patriots tight end Rob Gronkowski did not accompany the team Saturday on its trip to Chicago for Sunday's game against the Bears because of a back injury, according to multiple reports. Although the Patriots have not officially ruled out Gronkowski, he likely will not play against the Bears. Gronkowski, who is also dealing with an ankle injury, could travel to Chicago without the team, but that generally does not happen. Gronkowski, who leads the Patriots with 405 receiving yards on 26 receptions this season, is one of 10 New England players who is listed as questionable against the Patriots. He has been limited in practice all week. Reports also indicate that Gronkowski may play depending on how he feels. Despite not at full health last week against the Kansas City Chiefs, he had 97 receiving yards. He has not scored a touchdown since the first game of the season. He has been targeted only once in the red zone through the first six games of the season. ''It is what it is,'' he told reporters, frustrated, after the game against the Chiefs. ''First off, I've got to get open. I've got to get out there and run better routes and then I'll start seeing more targets. Whatever play is called, we're scoring points, we're scoring down there.